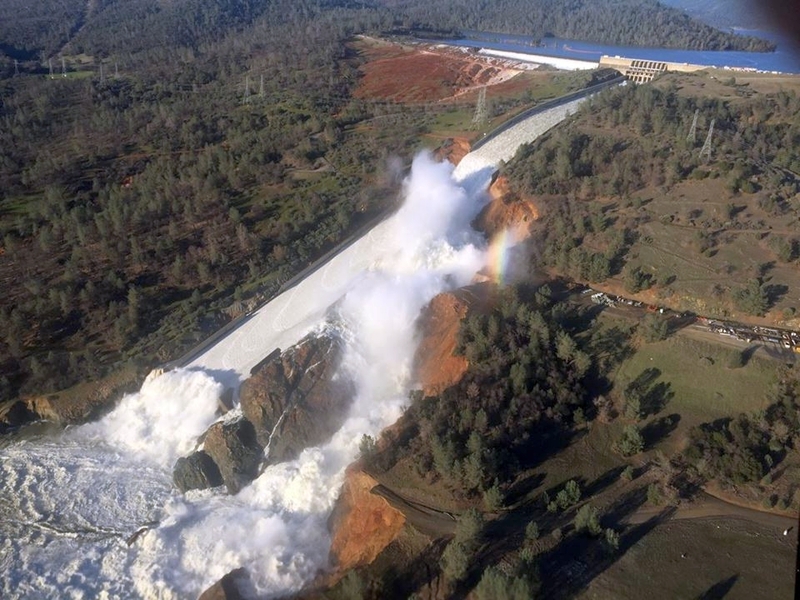 SACRAMENTO, Calif. (CN) – For decades, water seeped below the spillway of the nation’s tallest dam unnoticed by operators, slowly eroding critical infrastructure until the spillway crumbled during heavy storm releases this past February, investigators said Tuesday. According to independent experts investigating the Oroville Dam’s spillway failure – which forced nearly 200,000 people to evacuate beneath the 770-foot dam – human error played a key role in the near-disaster. State and federal officials relied on insufficient visual spillway inspections and missed major design flaws, the team said in a report issued Tuesday. The 7-page report cites design flaws that allowed water to seep beneath the half-mile-long spillway through cement cracks near drains. The water injections eroded concrete slabs and weakened rebar below the spillway surface dating back to the first discharge in 1969, the experts claim. The mounting erosion came to the surface on Feb. 7, after heightened discharges punctured a hole 200 feet long and 30 feet deep in the spillway. A series of heavy storms pounded Northern California, forcing officials to continue using the broken release valve through the spring. Located approximately 70 miles north of Sacramento, Lake Oroville is the state’s second-largest reservoir and the most important in terms of water storage and delivery capacity. Much of Southern California relies on water from Lake Oroville through the State Water Project. Annual inspections by state water officials missed the mark, according to the report. “Physical inspections, while necessary, are not sufficient to identify risks and manage safety. At Oroville Dam, more frequent physical inspections would not likely have uncovered the issues which led to the spillway incident,” the report states. The report added that the original blueprints hold clues to the dam’s design flaws. Thickness of the concrete above the drains was well below the minimum thickness elsewhere on the spillway and joints lacked water stops. The spillway’s drainage system wasn’t designed to handle the additional flows that seeped below the surface during water releases. The investigators, commissioned by the California Department of Water Resources to examine the incident, said seismic and groundwater factors likely did not play a large role in the spillway failure. The department says it is already conducting more comprehensive reviews of the spillway and that ongoing reconstruction efforts will address the report’s findings. The department says contractors are on schedule to have the main spillway operational by Nov. 1, along with repairs to the emergency spillway which was used for the first time in February. The state awarded the $275 million job to the lowest bidder, Kiewit Infrastructure West Co., this past April. The independent investigators will release their final findings in a report this fall.